I like that he tried something new. First of all, he didn't begin seriously studying art until he was almost 30. I mean, he was a law professor, for crying out loud. He was set. But he left his life as a University lecturer to pursue something completely different. He chose art over security. He intentionally changed the course of his own life. How many people actually do that? 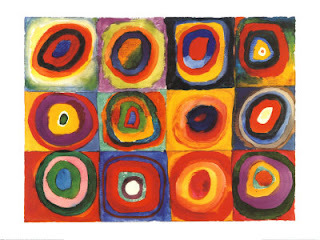 Plus, he was basically the first artist to create completely abstract pieces. And he continued to create them even though it irritated some pretty powerful people (ahem... Communists, Nazis). Finally, he was pals with a guy named Gustav Freytag, who I like to pretend is hiding out somewhere on my family tree. At any rate, my Nate and I made our own Kandinsky over the weekend. If you know me at all you won't be surprised to read that it's basically made out of garbage: a painted pizza box and some colorful plastic lids. The process is pretty self-explanatory, but here are a few photos anyway. So, tell me: what do you think? I love your Kandinsky - especially how you used lids instead of paint for the circles. Aw, thanks! I will say, it was a lot "neater" than if we had used paints. Almost nothing to clean up! I love my home county. Join me as I discover and rediscover all that it has to offer.